I'm all about delicate and feminine colors & fabrics lately...As you know, I adore the Boho style as well, but I also love to mix boho with other styles like dreamy, romantic or urban and rocker chic. This week, I was looking for some lovely and feminine fabrics at my favorite fabric store, but I couldn't find the kind of lace I was looking for. I just wanted to make a little lace dress for myself, so I think I'll keep checking out the other stores; at least I could find some other lovely fabrics to make stuff so I'm happy I went anyway. I'm also planning to do a DIY project soon to show you on my blog so stay tuned lovelies! It's always hard to find things when you are looking for them, lovely moodboard. Inspiring! I can't wait for your DIY!! This is so nostalgic and feminine! I love lace and flowers! I can't wait for the DIY!! This is such lovely style. These photos are perfect inspiration. good day fellas. I'm honestly into shoes and I had been searching for that meticulous make. The prices for the velcros were approximately 200 pounds on every site. But for all I set this area selling them someone is concerned half price. I in reality love these [url=http://www.menspradashoes.net]prada sneakers[/url]. I will definetly purchase these. what do you think? Flowers, lace and RUFFLES. Gotta have the ruffles! Love this gorgeous inspiration board! Cool blog! Really happy to have found it. Can't wait to see what you make. What a beautiful post! 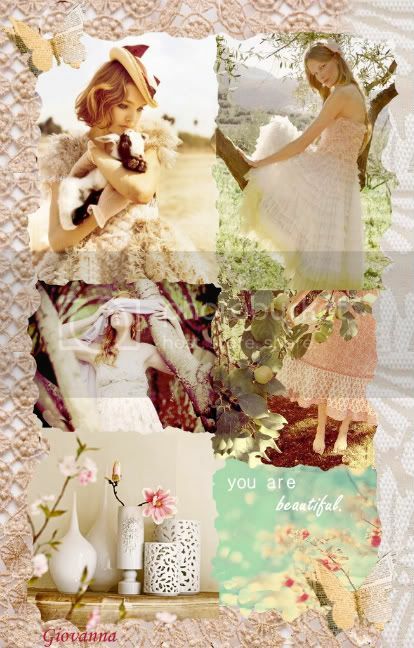 The lace and sheer femininity of the mood board is very inspiring. Good job! Have a great evening, my dear. and thanks for the comments, they mean the world! Excited to see your new project! And your mood beautiful is beautiful; I love the sweet vintage feel of it! Pretty colors! Giveaway Alert: Adorable vintage inspired belt!